Back in the 1990s there were several public transport options for getting up onto the moor. Today, the choice is sadly much more limited, making seasonal services such as the Haytor Hoppa bus (which in 2017 runs every Saturday during the summer until 16th September) even more valuable. The stop for the Hoppa was easy to spot outside Newton Abbot Railway Station: the throng clad in moor-ready clothing could only be heading out to the tors. Snippets of conversations indicated that many were long-term regulars who had used the service for many preceding summers, while others were, like me, making the trip for the first time. Further chatter followed the usual lines: grumbles about the weather forecast, intentions for the day, etc. The Hoppa picked up more passengers on its route to the moor via Bovey Tracey, and I tuned in once more to the chatter around me. Two strangers shared details of their medical histories; neither could drive but, under doctor’s orders to pursue regular exercise, had discovered a love of walking. For another lady, the bus was a social activity in itself: “What else would I do with my summer Saturdays?” It was a reminder of why services such as the Hoppa are so vital: they don’t just take people to their destination; they can also bring people together. On this occasion I was walking alone so I had intentionally not made firm plans; intending to keep my options open to suit the weather and my energy levels. With the drizzle on the tops forecast to burn off later as the sun climbed higher, I delayed the walking and stopped off at the Haytor visitor centre. Michael, an extremely helpful and knowledgeable representative of the National Park Authority, told me that the centre’s usual 10am opening time had been bought forward to cater for the arrival of this first bus of the day; full credit to the NPA for its commitment to making the service a success. Armed with some potential routes, both for today and future visits, I headed for the bus’s namesake: Haytor. Unfortunately the top was shrouded in clag and there was little to be seen of the usual panorama. Heading off the summit, I became briefly disoriented in the clag - a lesson once more in the value of carrying a compass. 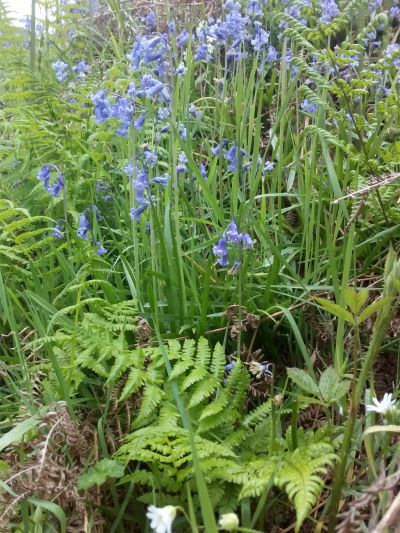 Arriving at Emsworthy mire, the bluebells were at the very peak of their beauty and the only sounds, the babble of flowing water and birdsong. Out the other side, the Devonian sun now bursting through, I crossed paths with the lady from the bus. Like all good walkers, we exchanged observations on the day so far and our plans for the rest of it. After my delayed start, time was ticking on. To catch the bus on its next round trip from Newton Abbott, I needed to take a straight line to Hound Tor. This allowed just enough time to grab some refreshment at the famous ‘Hound of the Basketmeals’ mobile café (opening 11am–4pm most days, tea served in a mug, just as it should be) before hailing the Hoppa at Swallerton Gate. “As with every organisation that has traditionally supported public transport, Dartmoor National Park Authority’s budget has been severely cut and, consequently, [so has] the ability to fund bus services. The Haytor Hoppa offers one model that, whilst still requiring support, doesn’t expect support from one source. The Hoppa service started in 2009 with support from Devon County Council, Dartmoor National Park Authority and also the Dartmoor Sustainable Development Fund. Running a circular, hop-on, hop-off route with one price, quickly attracted a loyal passenger following. The Hoppa also operated evening excursions, becoming a vital link for villagers on Dartmoor as well as visitors to Dartmoor. When the grant funding stopped, we were fortunate that the Hoppa was then supported by Natural England, Devon Wildlife Trust and the National Trust, all of whom have sites on the route, in addition to the National Park and Devon County Council. 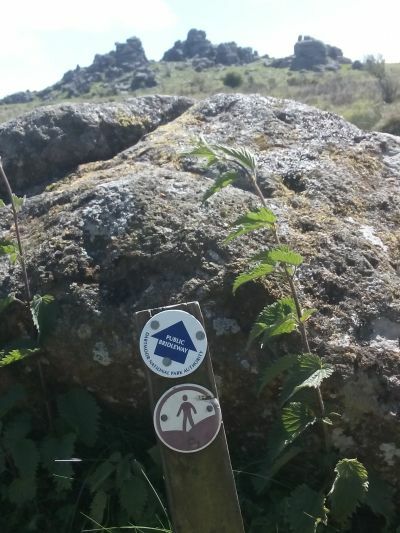 The Haytor Hoppa web page has a number of suggested walks, both circular and linear, that start and finish on the bus route. Tickets on the service are valid for the day and the service is 'hail and ride', meaning you can get on and off wherever it is safe to do so. Dogs are welcome onboard - accompanied of course - for a small charge.